Parsi Deviled Eggs - a delicious Indian style deviled eggs. Home » Appetizers » Parsi Deviled Eggs – Indian inspired deviled eggs have cilantro, lime juice, and honey in them to make them delicious. These are an interesting way to prepare deviled eggs. Indian flavors add so much to ordinary deviled eggs. This recipe is by Niloufer Ichaporia King. Be sure you mix the honey in well in these. The butter in the yolk mixture helps the yolk to firm up nicely, making these travel better than without using the butter. 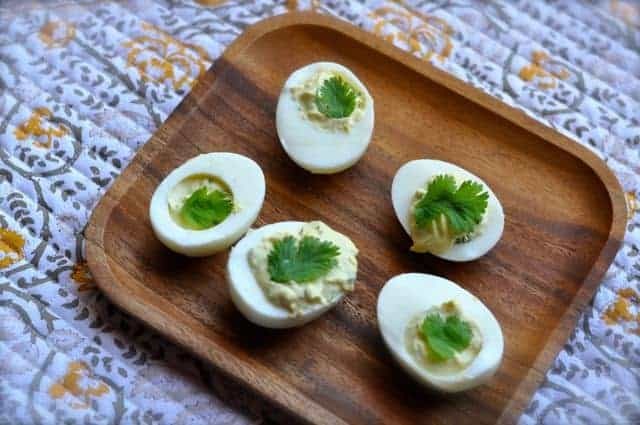 Indian inspired deviled eggs have cilantro, lime juice, and honey in them to make them delicious. Hardcook the eggs, and cut half lengthwise, and put the egg yolks in a small bowl. Set the whites aside. Add all of the remaining ingredients except the mayonnaise to the yolks, mashing well with a fork. Be sure the honey is well distributed. Stir in the mayonnaise and taste for lime and salt. Spoon the mixture into the egg whites, cover, and refrigerate for at least 2 hours or overnight. Let come to room temperature before serving. These are the best deviled eggs ever. I had loist the recipe and was glad to have found it online.